The designs of these engraved bronze memorial plaques are limited only by where your imagination can take you. 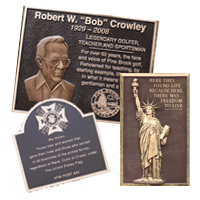 Our exclusive process allows us to create bronze memorial plaques or signs that truly are a piece of art. Designed to highlight your 2D or 3D designs, every plaque will stand on its own and make a statement to last for decades. As technology advances, the cost of creating these one-of-a-kind memorial pieces will fit into almost any budget you may have.